Colombo, Sri Lanka (CNN) -- Sri Lankan President Mahinda Rajapaksa will seek a fresh mandate in the upcoming elections in the South Asian nation, but he is facing a tough challenge from his one-time confidante and former Army commander, retired General Sarath Fonseka. "There has been abuse of power, corruption and nepotism. We want to abolish the executive presidency and make the parliament more answerable to the people. The best person to do this is the one who defeated terrorism," Ranil Wickremasinghe, leader of the United National Party, told CNN. Many of Rajapaksa's family members hold key positions in the government, such as his brothers: Chamal is a cabinet minister, Gotabhaya is Defence Secretary and Basil is a member of parliament and senior presidential adviser. Other members of the family hold important positions locally and in Sri Lanka's diplomatic missions abroad. Rajapaksa told an election rally last Thursday that he was confident "people would reject 'opposition machinations' to subjugate the freedom achieved by defeating terrorism" and said he was confident of winning with a large majority. The Tamil National Alliance (TNA), once regarded as a proxy for the Tamil Tiger rebels, negotiated in the weeks after nominations for the poll were announced with both Rajapaksa and Fonseka on addressing grievances of the Tamil minority that were the root cause of the 26-year separatist insurgency. Later, TNA leader Rajavarothayam Sampanthan declared his party had decided to support Fonseka because they believed he was more suited to address outstanding Tamil grievances. However, the Rajapaksa administration dubbed the move a "secret deal" to divide Sri Lanka. The opposition coalition has put forward a ten-point program titled on the lines of U.S. President Barack Obama's campaign slogan: "Believable Change." Their plan calls for abolishing the executive presidency, in which power rests almost entirely with the president while the prime minister is essentially a figurehead. It also urges tough measures to curb corruption, new legislation for media freedom, lowering living costs and providing jobs. "The peaceful conduct of the first post-conflict national election is of the highest importance for long-term peace and reconciliation in Sri Lanka." Rajapaksa has revised a booklet titled Mahinda Chinthanaya ("Thoughts of Mahinda") that outlined his policies in the 2005 presidential elections, this time spelling out more development programs, increased jobs and ensuring a "better tomorrow." In recent weeks, the presidential campaign has taken a more acrimonious turn. Fonseka has accused the government of ordering the Army to kill Tamil rebels who turned up to surrender during the last days of the war. The claims come as the Sri Lankan government faces international pressure to investigate allegations of war crimes during the conflict. Government officials have denied the abuse claims and refuted the allegations that surrendering Tamils were shot. "This is an allegation which popped up very recently, not at the time. And the government has categorically said that this scenario never happened," Palitha Kohona, Sri Lanka's Ambassador to the United Nations, told CNN's Christiane Amanpour in mid-December. The Rajapaksa administration, meanwhile, is accusing rival Fonseka and his family of engaging in corrupt arms deals, a charge Fonseka has denied. 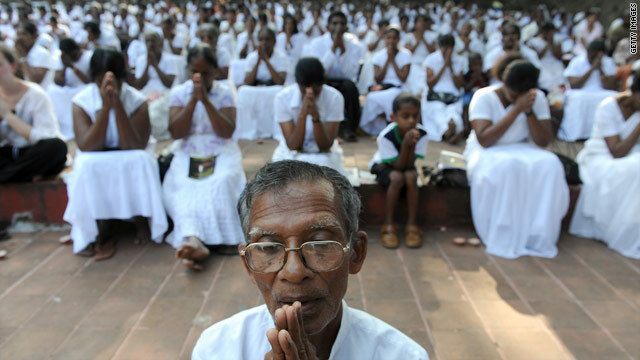 Sri Lankans will cast their ballots in more than 11,000 voting booths across the nation. Local leaders are urging a peaceful voting day amid escalating violence, including the shooting deaths of two people -- one a supporter of the opposition and the other of the government. "An atmosphere of freedom should prevail to express differing views on matters of policy if there is to be a free and fair election," president of the Catholic Bishop's Conference, Most Reverend Vianney Fernando, said in a statement. The spokesman for U.N. Secretary-General Ban Ki-moon said Thursday that the U.N. chief was "concerned about the growing violence in the lead-up to the presidential election."